We are offering Hand Operated Board Cutter to our clients. Floor Space: 70" x 62"
Having a definite quality management system, we are immersed in bringing forth a top class consignment of Board Cutter Blades. - Dimension: As per the sample / Drw. We provide to our client a wide range of Board Cutter. Suitable for cutting paper, corrugated liners & boards. The machine is fitted with front and back guides for measurement and the blade is perfectly balanced for smooth cutting. Heavy duty hand operated machine for Cutting of Corrugated Board and Plain Paper. Keeping in mind the ever-evolving requirements of our clients, we are devoted towards manufacturing an optimum quality range of Board Cutter. - This machine is heavy in design for manually operated and accurate cutting of duplex board, papers or 2ply corrugated board without damaging flutes of required size. Heavy Duty Hand Operated machine to cut the paper or corrugated board. 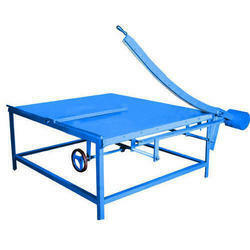 We are looked upon as one of the reliable Mat Board Cutters Manufacturers in India. The Board Cutter offered by us are manufactured using advanced technology to further make the machine a perfect match to the international standards. Foam Board Cutters are high durable and robust in structure. We stand amidst the most prominent Heavy Duty Board Cutter manufacturers of India. Our range of Heavy Duty Board Cutter is fabricated using optimum raw materials and complies with the highest international standards. Besides, these machines are used for cutting boards and plain papers. Customers can also be eased by the availability of these machines at the most economical price. Board cutters, rotary, eccentric slottor, chain slotter. ¤ Corrugation sheet cutter, cut off and punch cut blade. ¤ Careful selection of best suited alloy steel. HBC Board Cutter Heavy duty hand operated machine to cut the paper or corrugated board Table Size 48"x62", 58"x66", 68"x70". 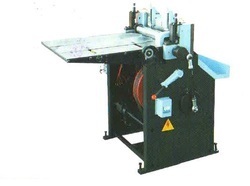 This machine(board cutter) is manufactured to cut the card board, corrugated board and paper. The cutting knife is properly balanced to enable free cutting by applying minimum pressure gauges are provided for accurate cutting. - Heavy duty with front & back guides hand operated with hardened alloy steel blades. - Available sizes: 52", 62", 72"
NAGPAL'S, Hand Operated Board Cutter. Backed by a team of adroit professionals, we are manufacturing and supplying an extensive gamut of Board Cutter.